This fall the ribbon was cut and the doors swung open on the new $8 million expansion project for the Anglo-American School of Sofia in Bulgaria. TruexCullins first developed a master plan for the school’s growth from 350 to 650 students, then provided Design Guardianship services as the new building addition took shape. Under the leadership of David Epstein and Diantha Korzun, the school doubled its classroom space, which serves middle and high school students from 44 countries. The project also includes new sports facilities, a performing arts complex, and an outdoor amphitheater built into the naturally sloping site. The new wing has a green roof, solar power collection, and greywater recycling. The existing wing received LEED Gold certification for Existing Buildings, and the new wing is currently being certified under LEED for New Construction. The school is the only LEED Gold-certified building in Bulgaria. The project was completed in August and the reviews are now coming in. 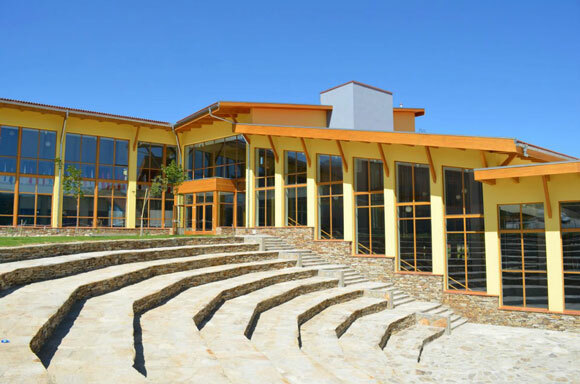 The Anglo-American School received Building of the Year 2006, and Sustainable Building Project 2010 by the Chamber of Architects in Bulgaria. The project was also profiled on the Interior Design website in October. If your Bulgarian is up to par, you can follow along with this video from the opening ceremonies. The event was attended by school officials, dignitaries, and plenty of happy students and parents to mark the opening of their new school.